Just before a red truss bridge (Bridge 537), turn right onto Mallardy Road, per signage for "Mallardy Road"
Turn left onto Forest Road 4032, signed for "Walt Bailey T.H." 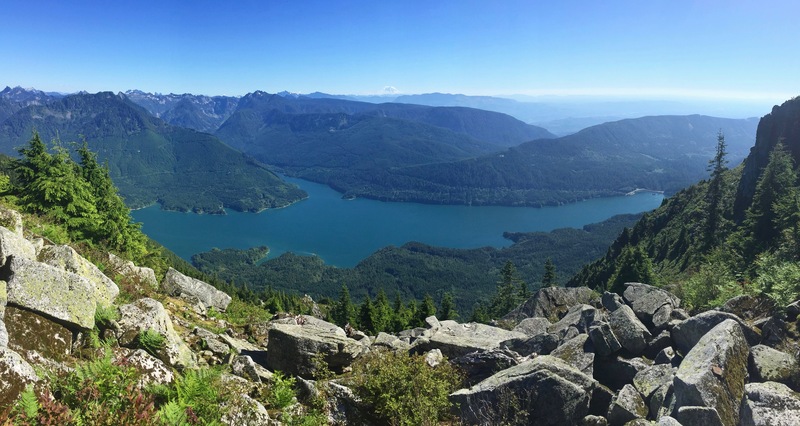 This page profiles Upper and Lower Cutthroat lakes, located in Snohomish County, Washington; the single lake of a similar name, Cutthroat Lake, is also found in the North Cascades, but on the mountains' eastern slopes in Okanogan County, Washington. The Walt Bailey Trail’s serene lakes, pools, and ponds are its signature feature. July 24, 2016. The Walt Bailey Trail climbs through alternating woodland and bogland along Mallardy Ridge to a pair of placid lakes set amid a labyrinthine network of tranquil reflection pools. The Cutthroat Lakes’ “basin” is more of an upland plateau riddled with ponds, tarns, and bogs and bounded on the south by a ridge of peaks stretching westward from Bald Mountain, just above the lakes, to the distant Mount Pilchuck. It is no wonder that water spatters the landscape: just beyond Bald Mountain, the much larger and deeply delved Spada Lake Basin traps incoming coastal moisture that creates one of the wettest regions in the North Cascades. Little-maintained since it was built, the rugged trail is rocky, root-writhen, and often rain-slickened throughout. Hikers who prefer trekking poles may find them especially useful on this trail. The trail climbs moderately to steeply, but, once the lakelands are attained, rewards the diehard hiker with a tranquil stroll along a network of paths that entwines the patchwork of lakes and ponds. Upon reaching the lake basin, head generally right to reach Lower Cutthroat Lake and generally left to reach Upper Cutthroat Lake. The trail to Bald Mountain switchbacks directly upward from the east end of Upper Cutthroat Lake before arcing westward to the summit. The trailhead is reached by a very narrow, one-lane road, often with steep drop-offs along one side. Drive slowly around corners and keep note of the many small pull-outs along the way, should you need to back into one to permit an oncoming vehicle to pass. Expect to encounter a few, but not many other hardy hikers in this backcountry stretch of wilderness. The moist trailside and lake basin are verdant during the summer months. Blueberries (Vaccinium sp.) are abundant throughout the lake basin and up the slopes of Bald Mountain, providing a bounty of summer fruits and a flush of warmly hued autumn leaves. The trail that bears his name was built at the inspiration and insistence of Walt Bailey, an active member of the local community who led its construction while in his 70s. The trailside terrain alternates between close forest and lush, boggy meadows. Walt Bailey Trail, July 24, 2016. 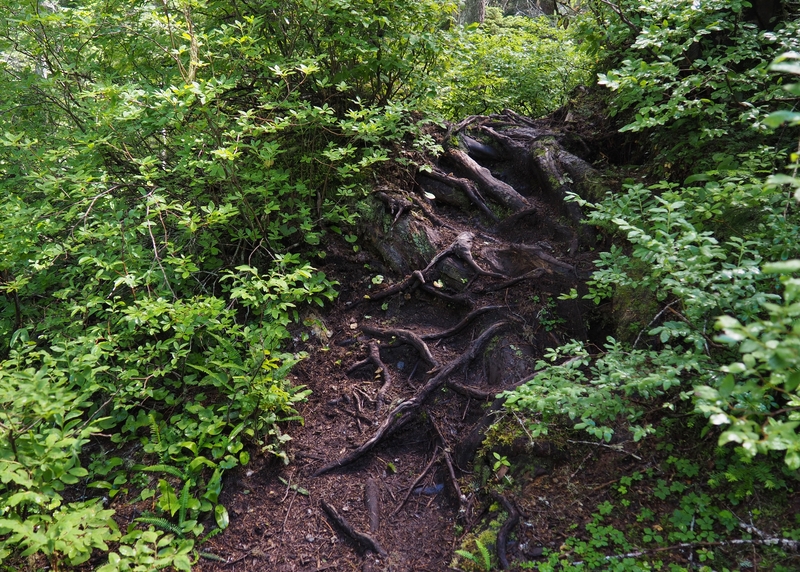 Often slick from the area’s abundant rainfall, treacherously exposed roots and worn, uneven stone are the typical surface of this undermaintained trail. Walt Bailey Trail, July 24, 2016. Even before the trail reaches the alpine lakeland that is its destination, it passes numerous small reflection pools along the way. Walt Bailey Trail, July 24, 2016. Frogs are abundant along the trailside’s many bogs, ponds, and streams. This one is likely either a Cascades frog (Rana cascadae) or a northern red-legged frog (R. aurora), which are virtually indistinguishable from one another when viewed from above. The underside of the Cascades frog will typically be yellowish and that of the northern red-legged frog predictably reddish, although the extent of the pigmentation can vary and individuals of each species can sometimes exhibit coloration similar to that of the other. Walt Bailey Trail, July 24, 2016. Varied species of diminutive native orchids populate the trailside. 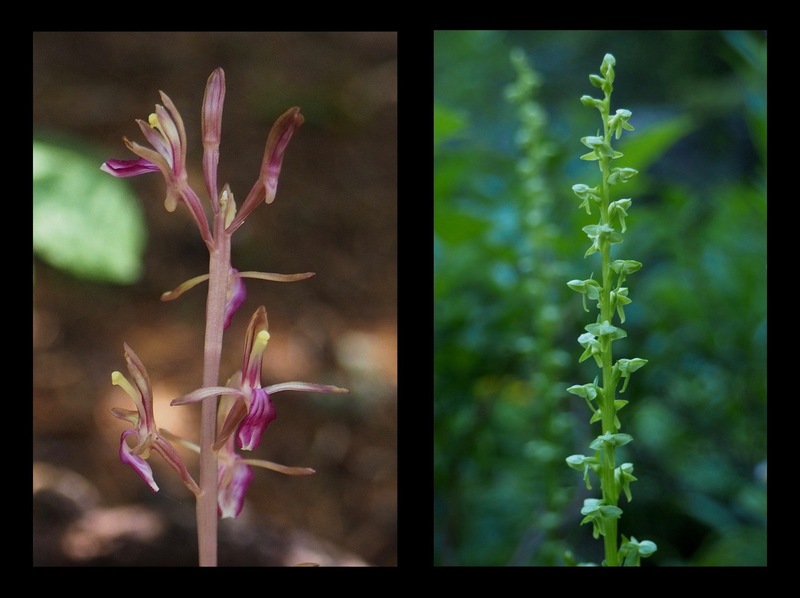 Lacking leaves and chlorophyll, western coralroot orchids (Corallorhiza mertensiana) (left) nevertheless thrive in the shadowy woodlands where few other plants bloom because they draw nutrients from fungi in the soil, rather than from light. In contrast, slender bog orchids (Platanthera stricta) (right) appear to contain nothing but chlorophyll, being uniformly green from leaf to bloom and readily disguised amongst the meadow grasses. Walt Bailey Trail, July 24, 2016. 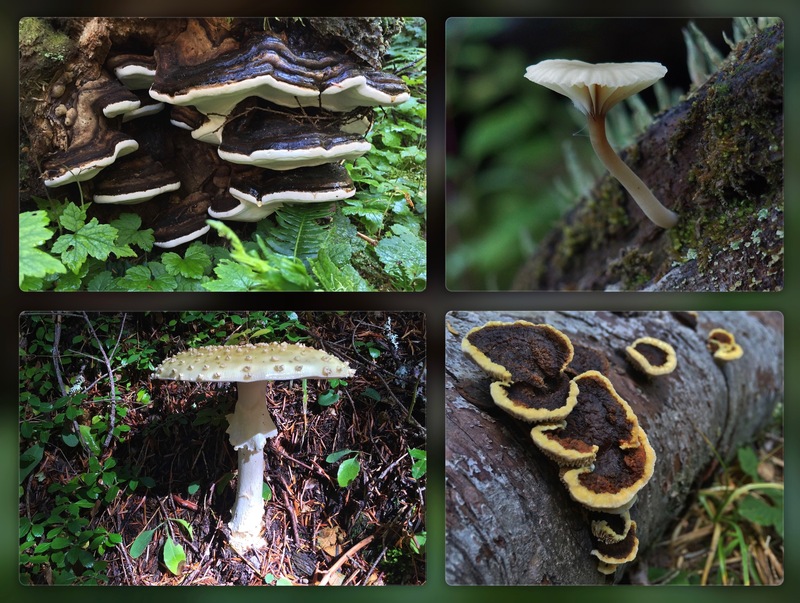 The trailside’s moist woodland litter also hosts a variety of fanciful fungi. Walt Bailey Trail, September 27, 2015 and July 24, 2016. Near its midpoint, the trail passes through a massive meadow strewn with debris and swathed in ferns and wildflowers. Walt Bailey Trail, July 24, 2016. Just beyond the midsection meadow, the trail encounters two large boulderfields where the path is easily lost among the stones. Look for small cairns built by earlier hikers to guide the way. Walt Bailey Trail, July 24, 2016. Throughout the boglands and along the woodland slopes, an array of summer wildflowers stipples the wayside. 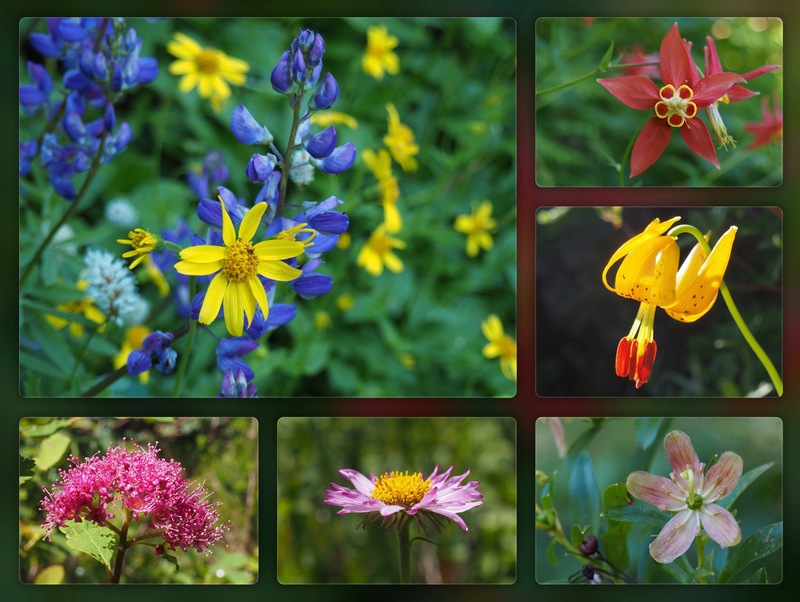 Clockwise from the top left, golden arnicas (Arnica sp.) and cobalt lupines (Lupinus sp.) join in complementary contrast; a western, or, Sitka columbine (Aquilegia formosa) reveals a honeycombed pinwheel; a Columbia lily (Lilium columbianum) nods into the brilliant sunshine; a copperbush (Elliottia pyroliflora) rears its elephantine pistil; a subalpine fleabane (Erigeron glacialis) unfurls its petals sunward; and a subalpine spirea (Spiraea splendens) lofts a sweetly scented nosegay. Walt Bailey Trail, July 24, 2016. As the trail climbs out of the bogland, glimpses of the panorama to come begin to appear, here, likely, Vesper, Morning Star, and Del Campo peaks. Walt Bailey Trail, July 24, 2016. Upon reaching the lake basin, the trail levels as it begins to meander about the many rock-rimmed tarns that surround the lakes. Walt Bailey Trail, September 27, 2015. Lower Cutthroat Lake occupies one of the terraces in the stair-stepped lake basin. Upper Cutthroat Lake lies just beyond the ridge above the lower lake’s eastern shore. Walt Bailey Trail, July 24, 2016. Alpine speedwell (Veronica wormskjoldii) ekes out an existence in moist grooves in the stone at the lake’s edge. Lower Cutthroat Lake, Walt Bailey Trail, July 24, 2016. Upper Cutthroat Lake’s placid waters create a dreamy, abstract image of the surrounding lakeside. Walt Bailey Trail, July 24, 2016. Autumn warms the lake basin with caramel hues. Upper Cutthroat Lake, Walt Bailey Trail, September 27, 2015. Most of the lakesides’ colorful autumn foliage is borne by the blueberries (Vaccinium sp.) that cloak the slopes and provide luscious, late-summer fruits. Walt Bailey Trail, July 24, 2016. In summer, drifts of heath and heather edge the ponds and stones about the lake basin. 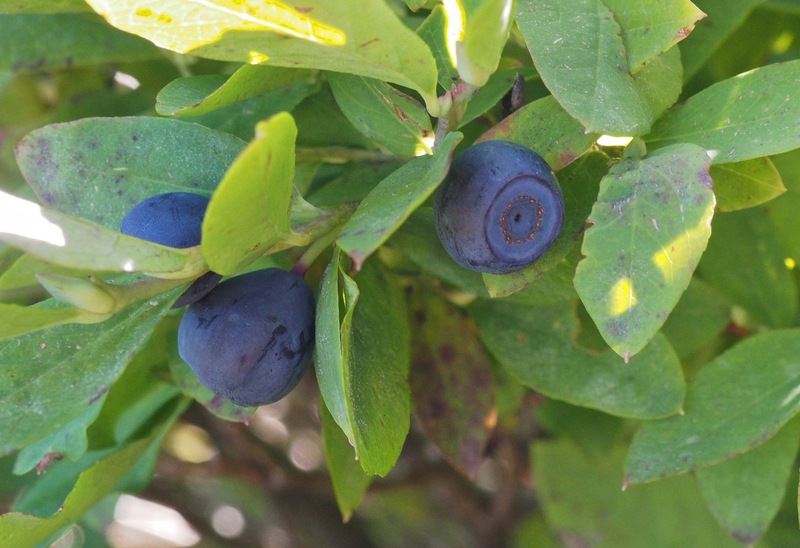 Both are distantly related in the same large and diverse family that also includes the blueberries (Vaccinium sp.) that are their lakeside companions. Although very similar in appearance, heaths and heathers can be distinguished by the forms of their leaves. Heaths, such as the pink mountain heath (Phyllodoce empetriformis) (top left and right), bear needle-like leaves, whereas heathers, such as the white mountain heather (Cassiope mertensiana) (bottom), are clad in small, overlapping scales. Walt Bailey Trail, July 24, 2016. The trail to Bald Mountain climbs from Upper Cutthroat Lake’s far eastern shore, providing glimpses of the lake’s bonsai-tipped islet and the mountains emerging on the horizon. Walt Bailey Trail, July 24, 2016. As the trail climbs the mostly forested slope above Upper Cutthroat Lake, beware of an almost hidden fork in the trail, marked only by a fallen sign that faces away from the incoming hiker. The trail to Bald Mountain leads downward to the right. The left fork, with a few branches scattered across it to indicate that it is not the proper route, leads approximately a half mile/0.80 km to impressive mountain views before disappearing into brush. Old maps indicate that it was an early route to the lake basin and mountain when the Walt Bailey Trail was first constructed. Walt Bailey Trail, July 23, 2016. Beyond the lake basin, Bald Mountain rears its stony pate. From here, the trail curves around and approaches the summit from the mountain’s opposite side. Walt Bailey Trail, September 27, 2015. From the upland meadows along the trail to Bald Mountain, sweeping views unfold across the now distant Upper Cutthroat Lake and on to the horizon topped by the side-by-side peaks of Three Fingers and Whitehorse Mountain. Walt Bailey Trail, July 24, 2016. As the trail wheels around to Bald Mountain’s southern flank, Spada Lake comes into view far below and, on the horizon, Mt. Rainier. Spada Lake was created when the Sultan River was dammed to provide drinking water and electric power to Snohomish County, Washington. Walt Bailey Trail, July 24, 2016. Approximately 1.50 miles/2.40 km from Upper Cutthroat Lake, a short, unmarked bootpath zigzags upward to Bald Mountain’s summit. Here again, look for cairns built by other hikers to guide the way. Walt Bailey Trail, July 24, 2016. A short scramble across the bouldered mountaintop leads to a viewpoint at a notch in the massive stones on Bald Mountain’s summit (here, on the left) and, along the way, affords increasingly grand views of Spada Lake, Mt. Rainier, and the surrounding North Cascades. Walt Bailey Trail, July 24, 2016. The boulder-framed, cliff’s-edge viewpoint on Bald Mountain’s summit provides a soaring vista of the Cutthroat Lakes far below and Three Fingers and Whitehorse Mountain far beyond. White Chuck Mountain, sometimes confused with Whitehorse Mountain, rises on the far right and is identified by its double, splayed peaks. Walt Bailey Trail, July 24, 2016. Beyond the side trail to its summit, Bald Mountain arches its rugged spine. The trail, a remnant of the old route to Ashland Lakes, appears to continue, but soon disappears into the bush. The “Location“ link above provides directions to the current trailhead for Ashland Lakes, as well as a link to a map of the Morning Star Natural Resources Conservation Area that protects both the Ashland and Cutthroat lakes. Walt Bailey Trail, September 27, 2015.